Prime Minister Dr Keith Rowley yesterday sidestepped demands for an apology to Muslims after a Carnival terror plot suspect claimed he was tortured into a confession when he was detained in Jordan earlier this year. Earlier this week, Sangre Grande resident Keegan Roopchan said he and his wife were detained by Jordanian authorities and claimed he was tortured and forced to go along with a script about an attack during the festival. Following Roopchan’s claims, religious group Muslims of TT called on Rowley to apologise to Muslims about fake news and information about the terror plot. 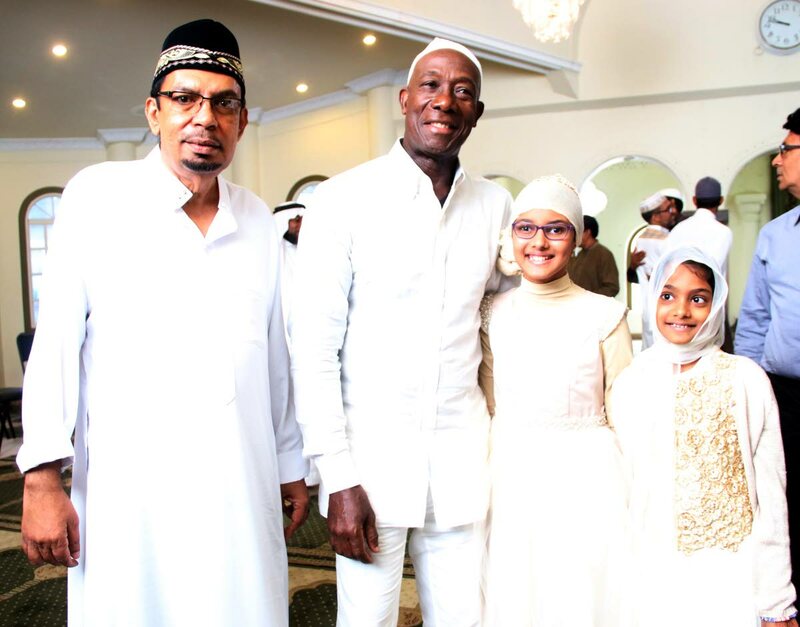 Rowley made the comments after visiting the San Fernando Jama Masjid for Eid celebrations accompanied by Local Government Minister Kazim Hosein. When the Prime Minister arrived at the masjid around 7.20 am he was greeted by a large crowd of people who had gathered to receive alms outside. Rowley and Hosein remained for the entirety of the service before visiting the Macoon Street Masjid a short distance away. Responding to questions about negative statements being made about Muslims in light of the Carnival terror plot and guns being found in a masjid last week, Rowley said he had his own message to send. “It is not because negative comments are made by some that reflects the view of the majority, one speaking negatively and saying the community this and the community that is far from the reality,” he said. He declined any other questions and was led away by Imam Mushtaq Ahmad Sulaimani to partake in a celebratory feast. During his sermon, Suliamani told worshippers that Rowley’s presence during their service was a message to them to put their heads and hearts together. “The Prime Minister is telling us: ‘Let us live as one family, let us put our head and hearts together in unity and that is how we will prosper,’” he said. Sulaimani said he was glad that thousands of people were accepting the teachings of Islam and urged others not to judge all Muslims by the actions of a few. Sunday Newsday reported exclusively that the man and his wife who were detained by Jordanian officials in January had confessed that there was a plan to disrupt Carnival by attacking non-believers of Islam. The man was said to have told both Jordanian and local law enforcement that planning for the attack began in 2014. One week before Carnival, police indicated that a terror plot was unearthed and raids began on several mosques. Fifteen people, including several named by the man as being involved in the plot, were arrested but only one man and a woman were charged with possession of a gun component. All the others were set free. The terror plot was criticised by some who said it was a hoax and an attack against Muslims. In a Guardian article Roopchan made the torture and scripted plot claim. On Thursday, Minister in the Office of the Prime Minister Stuart Young said Roopchan’s claims are wrong and police have tangible evidence about the terror plot. Reply to "I CAN’T SPEAK FOR JORDAN"